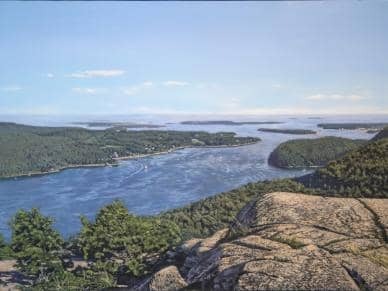 Being an Acadia Centennial Partner, The Gallery at Somes Sound continues the long standing tradition of educating, stimulating and encouraging the American people, through fine art and visual culture. My discovery of Acadia National Park and Mount Desert Island began while working on a research project on the art of New Hampshire’s White Mountains. I discovered Thomas Cole and his student, Frederic Church—and their landscapes not only of the White Mountains and the Catskills but also of Mount Desert Island. I was intrigued and mystified by these paintings, especially Cole’s seascape “View Across Frenchman’s Bay, from Mount Desert Island” and Church’s “Otter Creek, Mt. Desert.” I knew at that moment that I would someday visit this island called Mount Desert. Within the next couple of years, we moved here. I didn’t flinch when my husband came home and said “let’s move to Maine.” I simply said “I’ll start packing.” I knew no one here except my husband’s family—my roots were in New Hampshire—but, you see, something was pulling me in this direction. Just as with the paintings I fell in love with years ago, I was drawn to the beauty of the unrefined rocky shore, the smell of the ocean, the clusters of pines, the color of the sky at dawn, pink granite and hackmatacks…this was going to be my home—this was going to be my life. All who visit this national park become connected to something larger than themselves, and this happens through the spiritual energy swirling in the air, water, and earth at Acadia. It is only natural to want to give back, to preserve and protect the things you are connected to. I can do this by supporting and donating to an organization focused on the future of this national park. 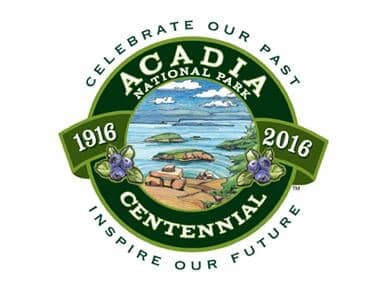 Friends of Acadia. My support goes towards beautification projects, the creation of new trails and walking bridges, and educating our kids to appreciate these gifts that are among the most important things in life.